The foot is made up of many bones and tendons including seven “tarsal” bones located in the middle of the foot (midfoot) and the heel area (hindfoot). 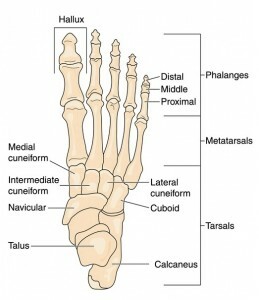 The tarsal bones include the calcaneus (heel bone), talus, navicular, cuboid and cuneiform bones. In some cases, these bones grow into one another forming a tarsal coalition. As a result, the affected foot becomes stiff and flat. Most often, the tarsal bones involved in a coalition are the calcaneus, talus and navicular. The condition may affect one or both feet. A tarsal coalition occurs when two or more tarsal bones in the midfoot or hindfoot grow together, attached by a bridge of hard bone, cartilage or tissue. The condition is caused by a genetic mutation affecting the cells that produce the tarsal bones. People who are diagnosed with a tarsal coalition have had the disorder since birth. However, it is typically not discovered until adolescence. In some cases, there may be no symptoms present and the condition is only discovered through X-ray imaging. What are the treatment options for a tarsal coalition? If you are experiencing persistent pain or stiffness in the midfoot or hindfoot, call our office at 212‑434‑4920 or fill out the schedule appointment form on this page so Stuart Katchis, M.D. can evaluate and diagnose your condition. Symptoms of a tarsal coalition usually begin to appear in the adolescent or teenage years once the bones have fully matured. Treatment for tarsal coalition is only necessary if the condition is causing symptoms. Nonsurgical treatment options are often quite effective at managing symptoms long-term. However, if the pain and stiffness do not improve with conservative treatments, Dr. Katchis may recommend surgery. Stopping or reducing all high-impact activities that make the pain worse will lessen the stress placed on the tarsal bones and relieve discomfort. Custom inserts placed in the shoes can help relieve pain by repositioning your foot and reducing pressure on the tarsal bones. Wearing a cast or walking boot temporarily will immobilize the affected foot, which may improve painful symptoms. If conservative treatment options do not improve your symptoms after several months, Stuart Katchis, M.D. may recommend surgery to ease pain and improve function. The type of surgery performed will depend on the size, location and severity of a tarsal coalition. The most common type of surgery for tarsal coalition and often performed in younger patients, this procedure involves Dr. Katchis removing the coalition and carefully replacing it with muscle or tissue from somewhere else in your body. The surgery restores proper function and range of motion to the foot by separating the two bones that were improperly connected. Typically performed on patients with more severe coalitions that may include arthritis, this surgery involves Dr. Katchis permanently fusing together the bones involved in the tarsal coalition. The bones are held in place using screws, pins or other special devices. The purpose of this procedure is to stop the painful motion between two or more bones, which is very typical when the joint has worn down. Patients who have undergone a resection surgery that has not relieved symptoms may be candidates for a fusion procedure. Surgical treatment for a tarsal coalition involves several weeks of recovery depending on the type of surgery performed. A resection surgery usually means a shorter recovery period since there is no bone that needs to heal together. A fusion surgery will require you to wear a cast to immobilize the foot while the bones heal. Whether you undergo nonsurgical or surgical treatment for a tarsal coalition, Stuart Katchis, M.D. will provide recommendations for long-term measures designed to keep your symptoms from flaring up, such as wearing orthotics and getting cortisone injections periodically. It is important to note that the stiffness and stress caused by tarsal coalitions may lead to arthritis.